Currently we keeping our eye open for a Customer Service Representative. Please apply below. This is a CUSTOMER SERVICE position where you would be the main contact for many long-standing accounts in addition to being support staff for larger accounts. You would be handling their orders and guiding them through the production. Your responsibilities would be to take customer orders from emails, submitted purchase orders, downloaded orders from an online order system or by phone. You would also be responsible for managing customer inquiries via phone or email. We are small company with a focus on the individual experience, so most of these orders require attention to detail. Each order stands on its own. Printing knowledge preferred. Skills involved are phone and email skills, good communication, experience requires excel, word, outlook and access. PrintSmith experience is a plus, also graphics, fonts, points and layout are beneficial, but attention to detail is the key. We pride ourselves on giving our customers excellent service as well as a quality product. Please apply on our website right below or email a resume to marla@h-bprint.com. 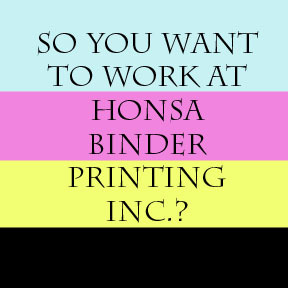 Have you Applied at Honsa Binder Printing Before? We are an equal opportunity employer. Please note that these following questions maybe required to do the job you are applying for. By answering these questions is not an automatic bar to employment. Can you lift 50 to 70 pounds on a regular basis? Have you ever pled “guilty” or “no contest” to, or been convicted of a crime? Please Note: By giving us this information you are giving us premission us to contact them. Please attach a file of your Current Resume. If you don't have a currrent resume to attach, please attach a file that includes your current and previous employment. When attaching these files please be sure to add your full name and what file you are attaching. How did you first learn of this job opportunity? I authorize investigation of all statements contained herein including the reference listed above, to give you any and all information concerning my previous employment and any pertinent information they may have, personal or otherwise, and release all parties from all liability for any damage that may result from furnishing same to you. I understand and agree that, if hired, my employment is for no definite period and may, regardless of the date of payment of my wage and salary, be terminated at any time without prior notice."